Few days before the promulgation of Nepal Constitution 2072, I stumbled upon a conversation among some people at a tea stall near my home. The conversation revolved around the role of India in Nepali politics. There were three points that I could take out from that conversation. First, India fully supports Madhesh agenda and, in fact, it was intentionally fomenting agitations to avoid timely constitution. Second, India wanted to avoid the timely constitution because it wanted to restate Nepal as a Hindu kingdom, which was supposedly agreed in a 'Bangkok meeting' between India, ex-king Gyanendra and China, with Russia as a surprise attendee. Third, this meeting happened when Home Minister Bam Dev Gautam deployed the army. In worst-case scenario, the United Nation intervenes and then Russia and China may use Veto Power to support Nepal. Just one week later, an overwhelming majority of Constituent Assembly passed the Constitution. The historic achievement was appreciated and warmly welcomed by global community. One of our neighbors, China, also expressed its happiness. But our southern neighbor just 'noted' the promulgation of "a constitution". A flurry of press releases and the immediate visit of Foreign Secretary S Jaishankar to Kathmandu, following the Indian Ambassador Ranjit Rae's numerous meetings with political parties suggest two things. First, it hints of India's failed to control the political agenda in Nepal and second, it gives a sense of India's defeat in enforcing its agenda. The press releases and hints of blockades by India generated a flood of comments on Twitter and Facebook. Twitter was awash with the hashtag #BackOffIndia. What does this signify? Did people suddenly turn patriotic or was it a sense of worry? At the same time, our fellow brothers in the Tarai have been living in the fear of bullet, shortage of daily needs, along with pain and agony. This has inspired a sense of revenge against Kathmandu. Indian behavior in Nepal has been widely criticized. The growing criticism may have negative effect on Modi's 'Look East Policy'. One of Modi's major agendas after becoming Prime Minister was to revise 'Look East Policy' formulated during Narasimha Rao government, with an aim to greater economic and security cooperation among neighboring countries. To ensure more pro-active role of India in neighboring countries, Modi visited Nepal. In his speech he stressed that India wouldn't interfere in Nepal's political matters. Recent events represent a big setback to Modi's foreign policy. India's aggressive and open interference in internal matters of Nepal will result in trust deficit towards India in the neighborhood. It's is interesting that some people think that India's intervention in Nepali politics is a tussle between R&AW and Indian Government. Research and Analysis Wing (R&AW) is believed to have a strong influence in several sectors in Nepal. Shastra Dutta Pant in his book Machination of RAW in South Asia, has spoken of its clout in media houses, political leadership and intellectual community. Normally, Indo-Nepal relation is seen as between Indian Government and political parties and R&AW and political parties. Even though R&AW is an intelligence unit, it seems to wield more control on Nepal's internal affairs than Indian government. It seems India's present dissatisfaction over the constitution is R&AW's doing. India's interference in South Asia is not new. India supports neighboring countries with financial assistance and also wishes to interfere in their political systems. But it is the duty of Nepali leaders to check Indian intervention. But our leaders instead try to curry favor with Indian establishment. Take Baburam Bhattarai. At this critical juncture, he quit his party and declared that he would join the Madheshi movement. What makes him do so? Is he genuinely concerned about Madhesh or is he just being opportunistic, trying to capitalize on India's unhappiness over the constitution? Tarai has been burning for over a month and people are suffering. But all that Kathmandu sees is a conspiracy. It is not keen on calling the disgruntled forces for dialogue with open arms. To some extent, political leaders in Tarai also share the blame. Had they utilized the achievement of the first Madhesh movement, such tragic situation may not have arisen in the first place. It's high time to find a political solution. Rather than thumping chest in Kathmandu, major political leaders must find a way to bring Madheshi parties to negotiation table. 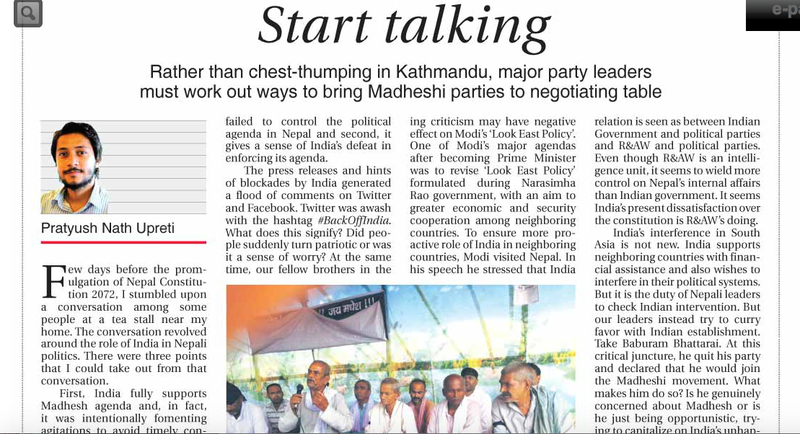 Madheshi leaders too must understand that dialogue is the only way out. They shouldn't incite the people in Tarai towards violence for political benefits. Most importantly, leaders in Kathmandu and Madhesh should understand that Madheshis are incomplete without Pahadis and vice versa.